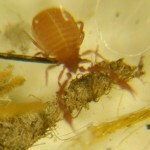 The cephalothorax and pedipalps are dark red-brown and opisthosoma paler, amber-brown; length of body: l.3–1.4 mm. This species is found throughout most of Europe. In Britain it is probably widespread, occurring in dwelling houses, shops, barns, grain-stores, stables as well as the nests of birds associated with man such as the house sparrow, dove/pigeon, starling and house martin. 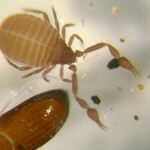 This synanthropic species is common but easily over-looked because of its small size. It is the ‘book-scorpion’ of Aristotle. Cheiridium museorum in thatch debris. Cheiridium museorum in imported Chinese ink block packaging.